When I refer to "Steampunk" jewelry, most people wonder what in the world I'm talking about. Really, it's quite simple to describe, visually. 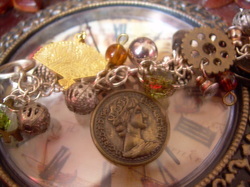 In jewelry, the term "Steampunk" refers to any piece made with a combination of gear-like ornaments, clock-oriented elements, key charms, industrial-type objects (rivets, pieces of mechanical gear, springs, etc. ), ornate filigree beads, and/or coins and Victorian-style charms. Generally, these pieces of jewelry are made in a color scheme that consists of metallic elements such as bronze or copper (or a similar look), tarnished silver, brown, amber, deep green, or clear glass beads, and pearls (or pearlesque beads). The general idea of Steampunk goes far beyond a style of jewelry. The entire concept of Steampunk is based on a "what-if" scenario involving the Industrial Revolution. What if, instead of electricity and petroleum, steam power had risen as the world's dominant energy source? For more information on the Steampunk subculture and fashion, click the button below.